I always enjoy seeing Mathalicious lessons in action. Here are students graphing the cost of pizzas (depending on the number of toppings) from Dominos Pizza. Each colored line represents a different size of pizza. Students successfully navigated several of the Standards for Mathematical Practice, including "Making sense of problems and persevere in solving them" as well as "Model with mathematics". 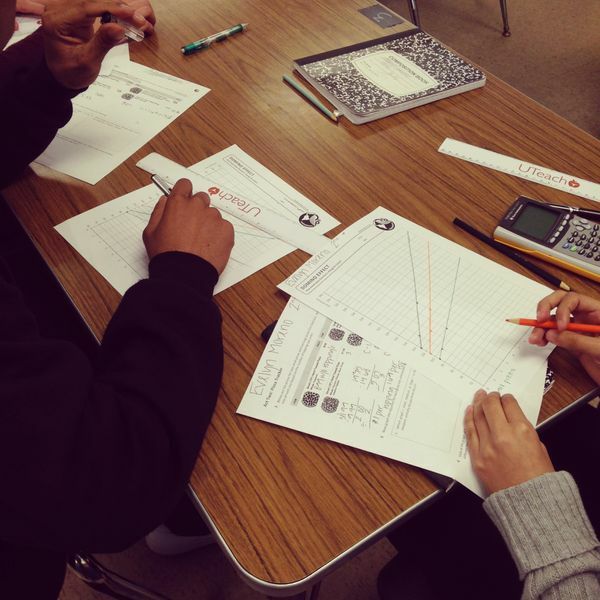 Students uncovered some misconceptions they had about numbers and graphing while doing this lesson. Hearing students translate their words & ideas into equations is so much more valuable than just memorizing an equation that has no meaning!